Every child wants to play. But the fences in our world, past and present cause pain to the youngest of our citizens, as is clearly illustrated in words and realistic illustrations, in this new book about the apartheid of South Africa’s past. This story clearly explains to our children of today what the separation of the races meant in South Africa. It wasn’t a fence taken down easily or quickly. Readers will see the main character grow older and bigger while still being denied the opportunity to play soccer with the other boys of the town. While this is categorized as a fictional account of the struggle to open up the country, it will be a valuable addition to every school library and classroom. It can meet the needs of the core curriculum as it strives to educate our youth of the mistakes of our global past while strengthening all basic literacy skills. 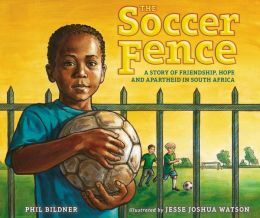 The many-layered story includes early riots, Mandela’s release from prison and his winning of the presidential election as well as the unifying soccer match that brought South Africa’s struggle to the world stage. It brings to mind Jacqueline Woodson’s beautiful book, The Other Side, which tells of such separation between playing children in the past of our own country. These books could easily be introduced together to discuss parallels in the societal developments of world history. Second grade, third grade and fourth grade readers will cheer for all sides whether reading the book individually or having it read to them by a teacher, parent or librarian. However, this book should not be limited to use in the primary grades, as it has such a strong voice and important story to tell.